When I heard about the Potter Month Celebration that Kristin & Megan were hosting, I just knew that I needed to join in whenever I can! 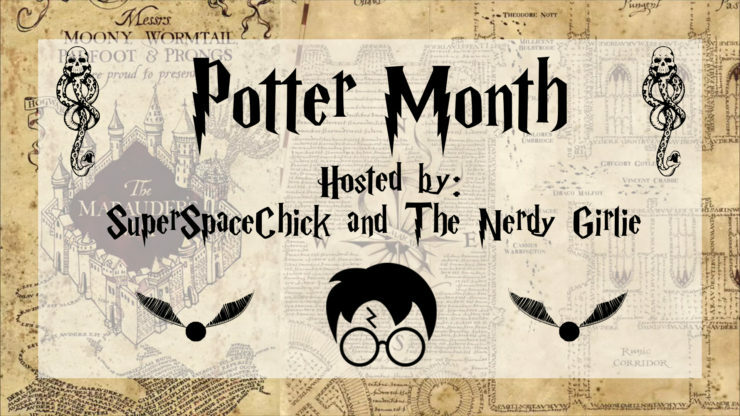 To sum it up, the girls have declared July a monthlong celebration of all things Harry Potter related and have invited everyone to participate by sharing new posts inspired by this wonderful, magical series. I'm really excited to have a couple of posts up my sleeve to be shared throughout the month, and I certainly hope you'll consider joining in on the fun! I decided to start off the month by sharing my personal Harry Potter story. I figure it's as good as time as any to revisit the origins of my Harry Potter obsession fandom, so I'll be talking a little bit about my experience with Harry Potter and the Sorcerer's Stone. 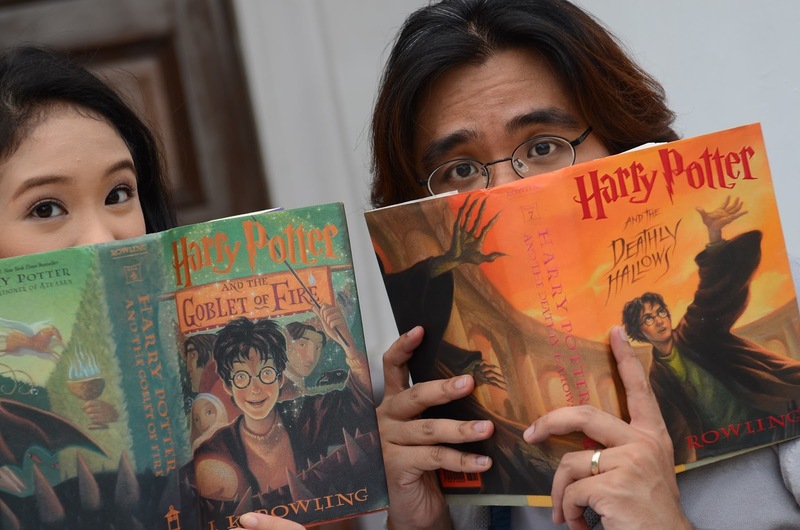 And Macky is also going to be sharing his personal Harry Potter story. To parallel my portion of the post, he's going to be talking about his experience with Harry Potter and the Deathly Hallows. Here's a confession: I didn't read Harry Potter right away. I had received the paperbacks of Sorcerer's Stone and Chamber of Secrets as a Christmas present from my mom, who had seen the books on a bestseller list and thought that I would want to read them. Unfortunately, at the time, I wasn't the biggest fantasy reader, focused as I was on finding the new Babysitters Club, Sweet Valley or Nancy Drew novel to read. I also didn't think much of the covers. So what did I end up doing? I hid these two books in one of my drawers. Flash forward to about a month later. I was tasked to clean my room, and was sorting through all sorts of stuff that had accumulated since Christmas. I had completely forgotten about the books in the my drawer, until I reached that area in my cleaning spree and rediscovered them. I was pleased to find them, as I was in between reads and looking for a new book to try. So, even though I still didn't know what to make of this fantastical story revolving around a boy main character, I decided to give it a shot. It was also, and even more importantly, the first story that inspired me and challenged me, showing me that imagination has no limits. I felt completely inspired after I read Sorcerer's Stone, and for a good few years after that, I would find myself writing, writing, writing and sharing that writing with my then high school friends. But I digress. What happened after I finished Sorcerer's Stone? That's easy! I immediately jumped into Chamber of Secrets. Oh, and one of my best friends in all the world (who is still one of my best friends until today and lives in New York now too) borrowed my copy, read it and joined the fangirl train right alongside me. It was the beginning of a beautiful Harry Potter era in my life - which hasn't really ended, come to think of it, and I prefer it that way! The day Deathly Hallows came out, I woke up at the most godawful hour of whatever the heck time it is before the sun rises, and headed out to pick up my then girlfriend and now wife Alexa. It was a crisp Saturday morning and I had done the ingenious thing of reserving copies that we could pick up at a tiny little bookstore tucked away at the side of my then office building at the time. We stood in line, groggy and sleep deprived and marginally pleased that we chose an obscure bookstore with a shorter line, as for sure thousands, if not hundreds of thousands of other Potterheads were somewhere else lining up at the bigger bookstores in droves. I remember very little of the store, and how long it took to get our reserved copies (yep, plural, since nothing was conjugal property then), but the line was probably quick. Before I knew it, I had dropped Alexa off to do whatever she needed to do and found myself at my apartment. Determined not to be spoiled by anything and anyone, I holed up in that place with no internet and a full fridge and read until the sun went down. The sobbing. Egads, the ugly snuffling sobs as the pages unfolded and Ms. Rowling's tale wound down and unfurled the past, present and future of these magnificent characters. Read Harry Potter. Cried all day. That sums up my day in with Book 7. And there you have it, friends! I hope you enjoyed reading our flashback stories. It's fun to reminisce about our very first experiences with books in the series, especially now that we're both rereading them. (I'm on Order of the Phoenix and Macky is reading Sorcerer's Stone at the moment.) Okay, now it's your turn - tell me your Harry Potter story! Do you have a specific memory attached to the books or seeing the films? What's your favorite book? Who's your favorite character? Tell me anything Potter related!